A smashing, award-winning debut novel that introduces Charley Davidson: part-time private investigator and full-time Grim ReaperCharley sees dead people. That’s right, she sees dead people. And it’s her job to convince them to “go into the light.” But when these very dead people have died under less than ideal circumstances (i.e. murder), sometimes they want Charley to bring the bad guys to justice. Complicating matters are the intensely hot dreams she’s been having about an Entity who has been following her all her life...and it turns out he might not be dead after all. In fact, he might be something else entirely. How did I go so long without reading this book (and series as a whole)? Shame on me!! Absolutely loved it! Where to start….. This is a quick read that is easy to follow with a few subplots, but again, easy to follow. The characters are, well great! They would so be the people I would want in my life and have them as friends! They each are quirky, smart, sarcastic, and witty in their own way! The dynamic between each of the individual relationships and the larger group one is written perfectly! Charley is a consultant for the local police department, assisting her uncle who is a detective with solving crimes. She’s also a P.I. , sees dead people and oh yeah, is the Grim Reaper! Busy girl! No wonder she’s a coffee-a-holic!! Which I can’t be one to talk as I do love a good cup of joe! Of course, add every day challenges (new cases, paying bills, waking up with enough energy to start your day, etc.) and of course a bit of complicated love life and well, it makes for not only an interesting day, but an interesting book. My oh my, speaking of Love Interests… Hotty Reyes!!! Can’t go into it without spoiling it but wow! A perfect combination of being hot, steamy and mysterious! Love how Darynda created that unique aspect of their relationship and didn’t give everything away all at once. You’re discovering things at the same time Charley is!! 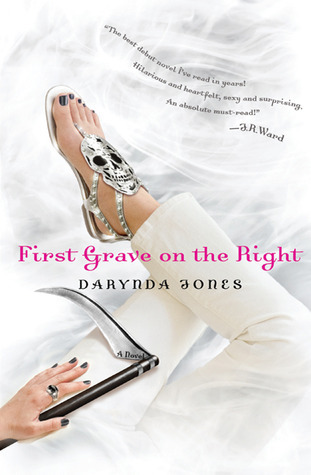 Darynda’s writing style is witty, creative, and hilarious! The book is filled with one-liners that will make you laugh aloud! Bonus that every chapter begins with either a t-shirt, bumper sticker or Charley quote! Brilliant!! Great series to read back to back (I couldn’t put it down so that’s how I read them) or use as a “breather” for when you’re reading “darker” books and need a “bright light”. Great review! I've been meaning to read this one for a while now. Ugh, I need WAY more time in the day!! Thanks DaVinciKittie!! There really isn't enough hours in the day!! I've said it a few times, I need a week off of work to just read :) That would be a wonderful "Staycation"!!! I'm such a Book-a-holic!!! I've had this one sitting my shelf for a while now and I wish I could get to it soon! I've heard so many great things about the series but I'm with Sue, need more hours in the day!